all the little stories» Blog Archive » art journaling… on a budget. 2. Found Objects: You will find a wide variety of fun things in your house that you can use to make impressions on your canvas! Here are just a few that some to mind: cardboard (for scraping paint), corrugated cardboard (I like using those Starbucks things that keep your fingers from burning), bubble wrap, an old flip flip (one with a textured pattern to it), a pencil eraser (for making dots), a paper doily, anything with holes in it (like a plastic non-skid mat), toothbrushes, paper towel rolls (for applying paint in a “stampy” way), lids to small bottles (for making circles). 3. Something to Paint on: You have numerous options that are cheap and/or free. You could re-purpose an old book. You could cut out several pages of a magazine and make your own paper (mod podge several papers together for added strength). Dig up an old diary or an unused journal. Chances are someone has given you something like that over the years! Or make your own book from start to finish with cardboard or watercolor paper (assuming you also have that on hand). If you don’t have anything on hand, I found my current art journaling book in the $1.00 section of Michael’s—so there are inexpensive ways to find what you need! 4. Paint: Here’s where you’ll actually spend all of your $10.00 at the craft store. Go to the paint aisle and look for the rows of little acrylic bottles. Pick out 8 colors to get you started. I’d recommend looking for a rainbow of colors in shades you know you love. Also look to see if there is an assortment of acrylics in a box set. You might be able to pick up more paint for less! But do the math first. If you have another $2.00 you can part with this week, buy a big old bottle of white, too. You’ll use it a lot and it will be your “cheapy gesso” until you have the budget to play with gesso later on. 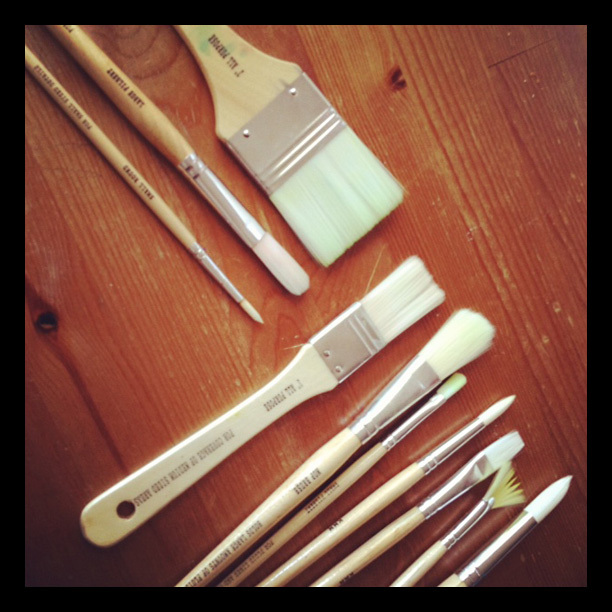 And if you have purchased one of those watercolor sets for your kids, feel free to borrow it back! If you find out later that you love watercolors more than acrylics, then you can look for a nice set of those. But don’t go spending $30 on watercolor paint before you really know what you like! 5. Newspaper: To protect your table. 7. Shoebox: My husband got new shoes. 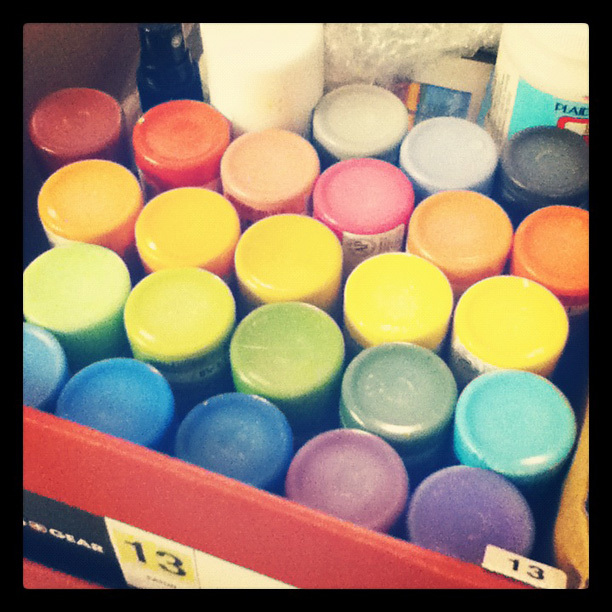 I got a box for all my paints! 1. 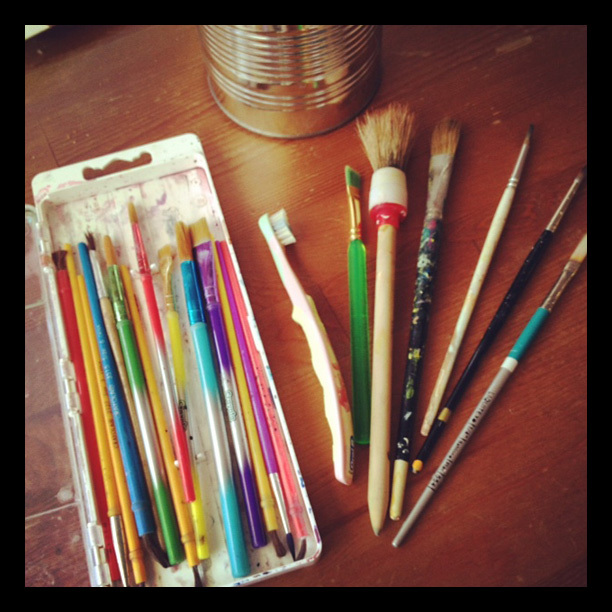 More Paintbrushes: If you don’t have that many brushes on hand you can pick out something cheap and fun from the store. Target has a huge set for kids in their crafts department (pictured below). This set will give you all the brushes you’ll ever need—and it’s just $10.00! If you just want to stick to a handful of brushes, then I’d recommend that you pick up a large 1″ or 2″ brush along with 1 medium sized brush and 1 smaller, pointed brush (see the three brushes at the top here). These are the ones I use most often. 2. More Paint: That probably goes without saying. More colors always equal more fun! I keep a handy guide with me when I go to the store. It’s a scrap of kraft paper that I’ve painted a color chart on… so I make sure that I don’t buy the same shade of green paint 25 times—because I would! I love green and I would probably think “Oh, I don’t have this one!” when I’m at the store… and then kick myself when I got home. 3. Stamps & Ink: Save money by purchasing stamps in sets. You will also want to be on the lookout for a good alphabet that you feel like you can use over and over again. I used to be really in to rubber stamping and cardmaking and I had tons of ink pads. But I’ve found that I don’t miss them. When I’m art journaling, I typically only use three pads: a regular black (for stamping images or background texture), a regular brown (for those times that black is too intense) and a pigment black (that’s ink that acts more like paint—I use it for titles). So I’d say that’s all you need! Some stamps you like, an alpha you love and three ink pads. 4. Alcohol Inks: These are fun! These are also expensive as all get-out. You can find them for about $5.00 each (for only 1 or 2 oz. of fluid). This amazing person, Birgit, will tell you all about how you can make your own for the price of travel bottles and rubbing alcohol. I have yet to sit down and try this, but I have five bottles and I’m ready to play! 5. Gelatos: I found out about these fun things from watching Christy Tomlinson’s videos (LOVE her!). They come four to a pack and they cost about $9.00, though. And you can only buy them in limited color sets (red/pink, yellow/orange/red, all green, blue/purple, neutral) and that’s annoying—because I want a rainbow of colors to play with! But Birgit also shared on her blog that Faber-Castel makes a set of these gelatos for kids. They are the exact same product–and you get 12 sticks for $10.00. They are in my shopping cart already. 6. Gesso & Mod Podge: Wiki says: “Gesso is a white paint mixture consisting of a binder mixed with chalk, gypsum, pigment, or any combination of these. It is used in artwork as a preparation for any number of substrates such as wood panels, canvas and sculpture as a base for paint and other materials that are applied over it.” It gives your paper or canvas something called “tooth” that feels great and helps to grab paint. You could use white paint to cover a surface, but having gesso around is preferred. Mod Podge is a crafty glue-like substance that you can use for a number of things to adhere, seal and finish a project. I use this to glue paper on canvas, to protect a part of my work that may bleed if I don’t seal it or as the final layer on a canvas. Birgit tells you above how you can make your own Mod Podge with Elmers. 7. Canvas: There are several inexpensive ways to get canvas. First, buy from a big box craft store. Second, take advantage of their coupons for 40% off! Or wait for “buy one, get one free” sales. Michael’s has these often. I’ll get two canvases at a time for just $8.00. My rough guess at the cost of picking up all these things… probably a $100.00. In 3 months by spending only $10.00 a week, you could have yourself quite a collection of things to play with! I love Christy Tomlinson. She offers amazing classes but she also is incredibly generous and offers free videos on her YouTube channel. And she is also on My Craft Channel as well. I also adore the work of karenika. And Julie Fei-Fan Balzer is amazing as well. If you need inspiration for what to put in your art journal, then sign yourself up for the amazing Brave Girls Club newsletter. If you’re a pinner, there’s lots of stuff on Pinterest. Here’s my art journaling board, if you’re interested in following me. I put both tips and quotes I like in there (so I only have to go to one play when I’m ready to paint). I hope you have enjoyed this post! And I hope you see how quickly and easily you can get in to this great hobby. Have fun! And remember—there are no mistakes in art journaling; just opportunities for creativity. This entry was posted on Friday, August 3rd, 2012 at 1:58 pm and is filed under art journaling. You can follow any responses to this entry through the RSS 2.0 feed. You can skip to the end and leave a response. Pinging is currently not allowed. Have to tell you about the faber-castell gelatos. I bought the kid’s set for $5.00 + shipping thru Amazon….with the shipping $10.00. The set is very cool! Love them! You mention Birgit a lot but I don’t see a link? Thanks.